This will be my first game jam and I really hope that I can complete what i have set myself. 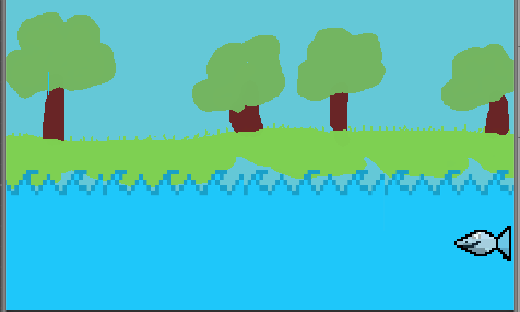 I have some programming knowledge and I have made a couple of small games in the past, however I am pretty bad at art so i may use a couple of external textures/Sprite. I am pretty good at music so I will make that(hopefully). an endless runner is a solid design for a game to be scoped in two weeks--do you have any updates to share? Eternal waves is about a fish trying to avoid other fish and keep the seas clean of monsters. I've made all the sprites and images but 1 I need for the game in its current state. I haven't been able to do the coding yet due to the issues above. Here's an image so far(i'm least happy with the background so that may change). I've finished working on the player movement script but i'm having trouble generating the enemies. I'm also now working in Unity 18.2 instead of Stencyl. Move enemies towards the player. If anyone can help with the enemy generation that would be wonderful. Hey, if you need some help with enemy generation I might be able to help you a bit. You can contact me on Discord, I've got the same username as here. I've completed the enemies scripts(with some help from mikister). I forgot collision so i'n going to need to add that. I've now started working on the music and the menu.